Project tracking in GamePlan just got a whole lot easier! When you double-click on a task, the dialog now shows a % complete field and a 100% button to easily set the task to 100% complete. Click the up or down arrow in the field or enter any integer value from 0 to 100. The Gantt chart will update to reflect the % complete, as shown below. When you first enter a % complete value, the task status changes from Planned to In Progress. GamePlan also automatically creates the timesheet data that reflects the task being partially completed on schedule. This is important because it means you still have a permanent record of when the task was worked on. If a task is partially completed, but it was started late so it is not on schedule, there are two ways to accurately track this. The first is to press the Edit Timesheet button and enter the timesheet data for when the task was worked on. This functionality has always existed in GamePlan. The Edit Timesheet button is found in the Data Panel, as shown below, or on the pop-up dialog after the first timesheet data has been entered for a task. Note that after you enter a timesheet, GamePlan calculates the % complete from the entered timesheet data and you can no longer edit the % complete field. 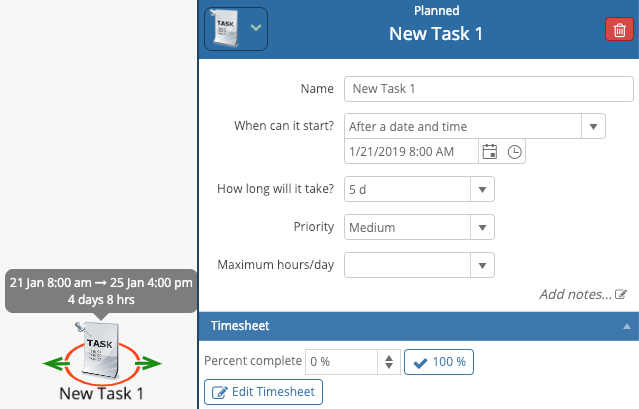 You can still set a task to 100% complete and the timesheet will update to reflect the remaining work on the task being completed on schedule. 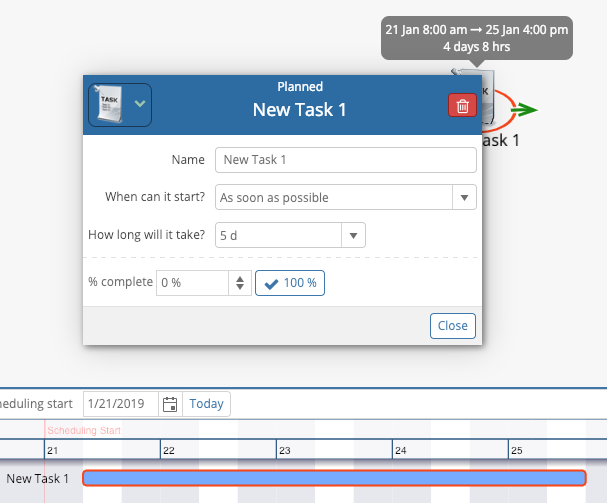 The second way to set a task as partially complete if it starts late is to use the ‘When can it start?’ field and choose ‘After a date and time’. Then choose when the task started and enter the % complete. Timesheet data will be created to accurately reflect when the task actually started. This same technique can be used if a task starts on schedule and then there is a delay. Enter the % complete that is done on schedule and then change the ‘When can it start?’ field, enter when the task re-starts after the delay, and then update the % complete. Timesheet data will be created to accurately reflect when the work was done. 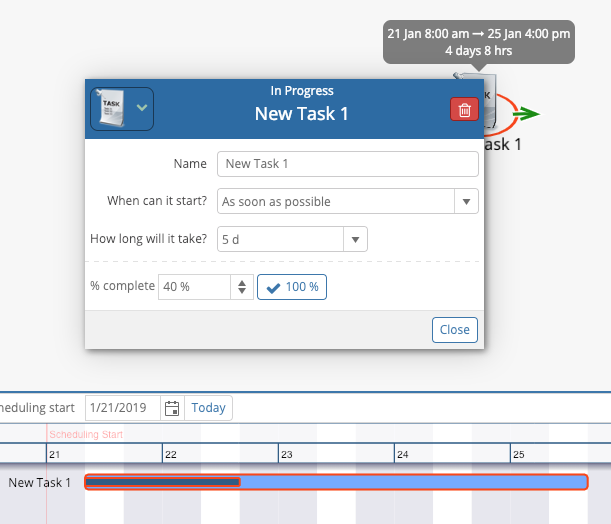 This new functionality will make tracking a project in GamePlan much easier, while still creating timesheet data so that GamePlan maintains an accurate record of the time worked on the project. We welcome any feedback you may have on this new functionality.